Featuring a porcelain tile hearth top and a base constructed from aluminum, this fire pit table offers a lighter alternative to OW Lee's wrought iron tables without skimping on strength and durability. 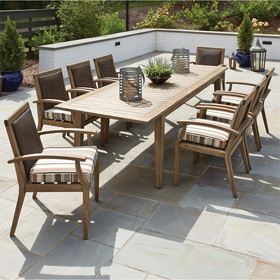 The table is a perfect choice for bringing warmth, cozy ambience and convenient surface space to small and mid-sized outdoor lounge areas. Additionally, the table's hearth top sits in a protective smooth rim that allows the fire pit to be moved as a single unit. Table burner is 20 inch Rd. 42"L x 42"W x 18.25"H 150 lbs.